I'm going to guess that I was around 9 or 10 when I first read this? I think the actual version I had is packed up in a box somewhere around here. It was already beat all to hell when I got my young hands on it and I can only assume that it belonged to my mother in her youth. I read it many, many times and it only got better with each new reading. I grew up with this book and understood it a bit better every time I read it. Well, as much as you can understand a novel like this. 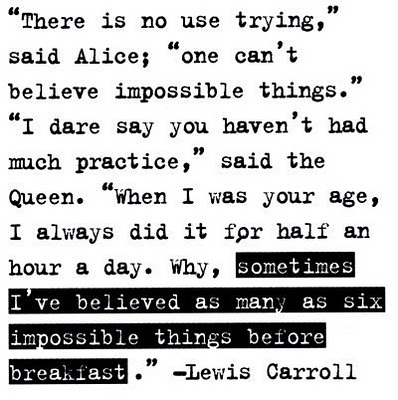 Do you know of any other book that has inspired so many people? The art, the quotes, the movies, the tattoos! 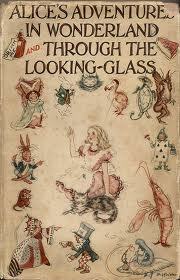 Would anyone like to design an Alice tattoo for me? * I'm game. Check out the Alice items on Etsy, or the amazing amount of art on Deviantart. I have NO idea what the first novel I read would be... hmmm... maybe Little House in the Big Woods? Dang, that would be fun to know. Maybe my mom remembers? Ha! Strawberry Girl by Lois Lenski. I was in second grade and I think it took me a month to read. I don't think I comprehended what I was reading. I just wanted to be a "big girl" and read a chapter book. I have no clue. . . The first I remember would probably be the Babysitters Club Little Sister books with Karen! Do you remember those??? 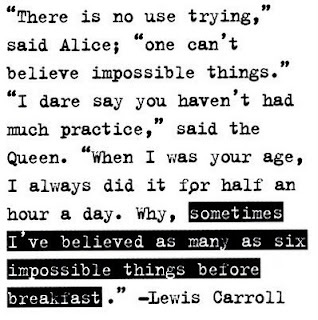 I have a deep and abiding love for Alice! I think my first novel might've been The Wonderful Wizard of Oz.